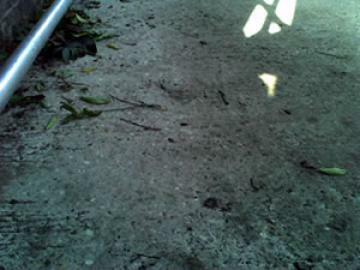 A concrete disabled access ramp must be surfaced appropriately for safety and practicality. 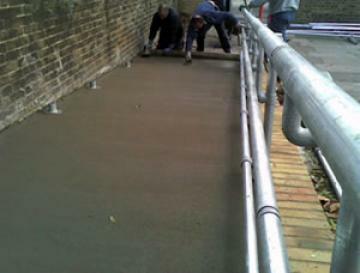 This London school found that their ramp was unsuitable, so they contacted us at Concrete Renovations Ltd. The client’s concrete ramp was designed to enable disabled accessibility but at the time, it was far from suitably equipped. The exposed and unfinished surface of the concrete ramp meant that travelling up and down it on wheels would not only be difficult, but uncomfortable too. Furthermore, the concrete ramp had never been covered with a non-slip material, making it even more challenging to climb and potentially unsafe, too. Concrete Renovations Ltd were tasked with rectifying the issues, ensuring quality, durability and safety for all the future users of the ramp. Especially as the primary purpose of the ramp was to benefit those with disabilities. Our initial analysis highlighted that the concrete ramp resurfacing procedure would have to involve scrabbling the top layer of the concrete. This was necessary to remove any surface contamination and maintain a consistent level before we began to lay down our resurfacing product. We opted to remove 6mm from the top of the concrete, as this would allow us to match the original height of the ramp after our work was completed. After the scrabbling was concluded, we opted to cover the ramp using Sikatop 77 due to its durability, high performance and heavy-duty nature; all properties which are essential for a school concrete ramp that will see regular use. To ensure the new surface was non-slip and practical, we drew a soft brush across the uncured material. A safer and more durable solution to the school’s disability access needs. If you would like to find out more about our concrete ramp resurfacing services, please don’t hesitate to get in touch, or give us a call on 01733 560362 if you have any questions.